Squash House Quilts: Quilt Market Fashion and Giveaway (Now Closed)! In the last ten years or so we've all seen a lot more garment designs from quiltmakers. I did a lot of garment sewing as a young woman and never really lost my love for it. The only thing I lost was the time and effort once I began my working life. I've had the urge to rekindle that long ago passion, too! I thought you might like to see some of the great dresses I saw while at Market! This reminds me of something my mother might have worn in the 40's. Now it's been updated for our new century! I think this dress is totally timeless. Hmmmm....how about a patchwork wedding with that train? I was floored when I saw this selvedge dress! Gemma Carelton, Jodie Carleton of Ric-Rac's daughter made it! I knew there was a reason I was saving selvedges! And look at this room! Kind of reminds me a bit of Steam Punk and vintage mixed together! This is a new fabric line from Tim Holtz (his first) through Coats and Clark. Wow - Coats and Clark have come a long way since I was a very young sewer! The line is called Eclectic Elements and I want all of it! 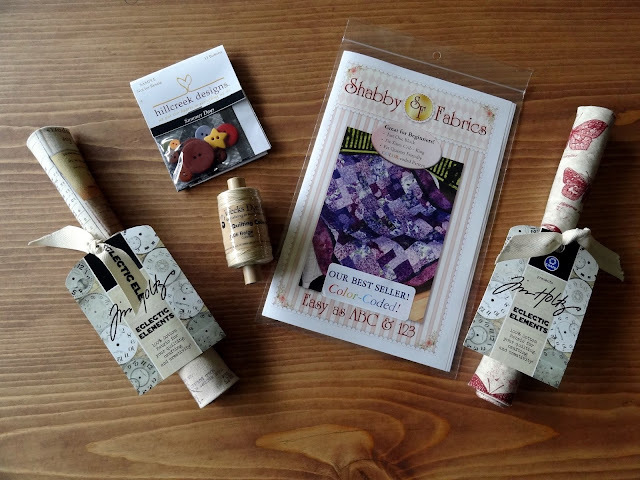 I was lucky enough to score 2 fat quarters of Eclectic Elements along with a Shabby Fabrics pattern, some Hillcreek Designs buttons (pattern included) and a spool of Weeks Dye Works 40 wt. quilting thread! Leave a comment telling me if you've sewn any garments lately and I'll enter you for a chance to win all of this! US and International commenters are welcome! NO! No garment sewing for me - the only time I have ever made any clothes is when I was young, in 4H, and my mom was standing right over me through it all, telling me exactly what to do. It was not enjoyable! Mom still laughs that she had to basically MAKE me sew then, and now you can't get me to stop! I made almost all of my clothing until my early 20s (long time ago!). Life got more involved and for years I sewed nothing. I did recently make 3 simple skirts (elastic waist, no less) to pair up with tees and flip flops for summer. I am just finishing a jacket that I started quite a while ago. See all of the garments has got me enthused. I have a shirt that I am working on out of quilt fabric. I hope I win. Please don't include me in the Give away...I just wanted to say how wonderful it was meeting you...and, I did not see even 1 of these dresses, lol I would have loved the selvage dress! I to sewed a lot of clothing when I was in high school. Have thought about at least trying to sew some tops. You get sick of what you are finding in the stores lately. Go to Pinterest when you get a chance and put in cloth patterns from the 60's or 70's. It will bring back a lot of good memories. Thanks for sharing your trip to Market. Hope you have a great week. Fun seeing all those photos :-) I haven't made any clothes yet - but I am wanting to make a start soon! I used to sew sew many of my clothes and then when I had kids I sewed some for them but never seemed to have enough time to make good use of it. Now that I have grandbabies I'm having fun though. I made some skirts for them for Christmas and they turned out so cute. Amazingly they were out of old Disney fabric I'd bought for my own kids but the granddaughters loved having Little Mermaid, Lion King, and 101 Dalmation skirts! Sewed most my clothes in younger days and now have made a few dresses for granddaughters. Or shirts for teddy bears! I love the first 2 dresses in your post! I haven't done much garment sewing since I started quilting, but I did enjoy making Halloween costumes for my DD. It looks like you had fun at market, and oh my - that kitten is adorable! I'm sure you are excited to bring her home! HI!LAST ITEM I MADE WAS A FITTED VEST FOR MYSELF>SO FUN! LOVE MACHINE QUILTING BEST! THANKS FOR SHARING! oh those dresses were amazing. I haven't sewn a garment since I was young. With the cost of fabric it seems cheaper to purchase clothing rather than make it. But wow, that first dress with the large collar, LOVED it. Might make me rethink how I feel about sewing clothes. Hugs!! I make all my summer dresses from quilt fabric and have done since I first started quilting. Also, quilt fabric needs less ironing, in my experience, than dressmaking fabrics and can be worn straight from the tumble dryer when on holiday. I made myself a skirt and have one in the works that needs to be finished. I'm supposed to teach DD how to make a skirt for her young woman project. That'll begin to do with her. The last time I sewed garments was some warm flannel pj's. I'm not much of garment sewer, but I sure do love the new patterns that are coming out. I sew garments for my married daughter - she has the PERFECT figure so sewing for her is a delight. Most recently I sewed a paperbag skirt for her. I think I probably gave up garment sewing in about 1983. I started a project, and promised my roomie that if she would finish it for me, I would never sew again. Imagine her shock when I told her I took up quilting!! I haven't made anything for me for years but I'm enjoying making dresses for my great niece at the moment! I love those clothes! I never learned to sew garments, so it's something I would love to try now. Especially vintage looking! I taught myself how to quilt when I was in my 30's... flat and straight have been in my favor! I have not sewn any garments in the last 15 years but I did buy 2 patterns that called out to me just last week.blouses. I have not sewn any garments in a few years. I had thought I would sew dresses for my granddaughter but she's five and has yet to get a dress from grandma. Thanks for the opportunity. For me, Candace - you "hit' it!!! I LOVE to make garments - of all kinds. I had no idea you did too. Everyone already knows I'm an "Apron-holic" but I doubt if anyone really knows that I am a garment seamstress first and foremost. I love "one-of-a-kind" items like wedding dresses, Halloween costumes, formal ensembles and TOPS !!! When DD and I were at Sew Expo this year, my focus was garments!!! I think I must have brought home 6 or 8 garment patterns. And I actually downloaded two patterns recently for dresses/tops. You'll be seeing more garments on my blog soon. I'm not a garment sewist but I really would like to make simple things. Especially knit tops! One day, I'm going to DO IT! The only sewing of clothes I have ever done is my kids Halloween costumes when they were little . I think the last time I sewed anything in the way of clothes was an apron at school! I consider myself a novice sewer when it comes to sewing so garment making is way out of my realm of capabilities. Having said that, the only subject I ever failed in school and four years of university was Home Ec. I never did get that ugly dress finished. Love those that were on display at Market, though! What an exciting show! I like dressmaking I think the last thing was that Kaffe Fassett tunic dress after I bought a couple of meters of fabric from the Birmingham show. I have plans for a 1930s grey cotton fabric eventually. It is scrummy! I have never sewed garments. It's funny, two years ago a picked up patterns and fabric to make some shirts for work. I can never find what what I'm looking for but have been worried to take that first step. I think that will be my project after I finish my current quilt. Sewed costumes for my youngest son's high school theater troupe and swore I would never ever sew another garment again after he graduated and that has been 5 yrs ago and have not sewn any thing remotely close to a garment since then. I sewed clothes when I was younger but not recently though I did just buy fabric to make myself a simple top. I don't garment sew, only quilt. I hated sewing in school. Now I'm in my room sewing 1/4" seams a few hours a day. what fun to see all the cute dresses. phooey! I missed your giveaway.